BSAR AERIAL RIVER SURVEY:* “Uncountable” - The Delta Discovery, Inc.
Today (12.5.17) BSAR members flew with U.S.F.W.S pilot Robert Sundown to do an aerial survey of River conditions. The area flown was from the mouth of the Johnson River to George Morgan’s old fish camp 8 miles above Kalskag – about 130 River miles. The focus of this flight was to get an overview of the number of and location of open water areas so that Kuskokwim Search & Rescue teams could start planning for marking them. The number of open holes is uncountable at this time. • The unusual number of holes below Napakiak to the mouth of Johnson River – there are at least 6. They are all in the middle or towards the north side of the River. • The closest open hole to Bethel is near the Bethel Bluffs – there are more from the upper end of the Gweek Island to the Y. • The unusual number of BIG open holes in Kuskokuak – especially from the Y to Kwethluk – there are 3 in this stretch and many more upstream of Kwethluk. • The main stem Kuskokwim River below Tuluksak is unpassable at this time. Two open holes reach out to each other from both the west and east banks with only a very narrow patch of ice between them. The short cut slough below Nuukpuq (the fish camps) is wide open – bank to bank. • While there are many areas open that are commonly open there is much more open water in areas we haven’t seen before. • None of the open holes observed today are making new ice – it’s still too warm out. 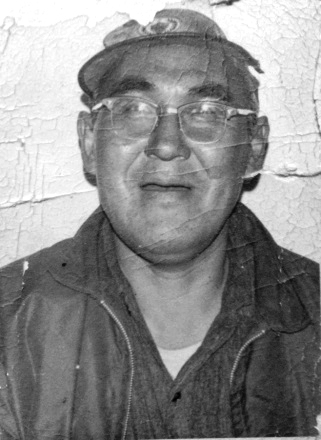 Coffee’s Bend was named after John “Coffee” Smith (above) who used to have his fish camp on the north side at the top of the bend. This is much more open water than we should be seeing for the first week of December. It looks like the back trails will continue to be critical for safe winter travel for a while yet. We did notice one important trail change since our 12.3.17 River Report: due to heavy overflow in Oscarville Slough the trail to Napasiak and Oscarville has now switched over to the main River. A big thank you goes to Robert Sundown, Manno Rodgers, and the United States Fish & Wildlife Service for their support of safe winter travel in our region! Thank you, and Safe Travels from BSAR. *Please note that this report is for informational purposes only. It is not an advisory that it is safe to travel.